Math Flaps is a teacher-friendly classroom manipulative designed specifically to teach the operation of division. However, it can also teach the addition, subtraction, multiplication, factoring, odd and even numbers, negative numbers, sets, and units. 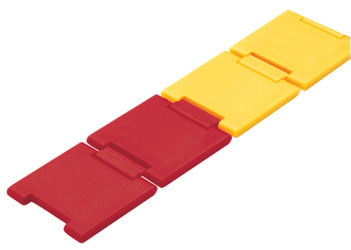 Math Flaps consists of a set of math flaps that can be connected together to make any number. The math flaps have two permanently connected parts, the flap and the link.